What was the background to this initiative? Academy developed a toolkit to support organisations in developing and implementing a Talent Management strategy and framework at organisational level, which would support the operating framework’s requirements and link directly to the approach used by the Academy. The SHA and The Leadership Academy was tasked with assisting leaders across the region to assess talent and leadership and develop talent and leadership. These actions needed to be aligned coherently. Individuals needed to be assessed and developed on their current performance and against their potential and their ambition. Current research and statistics points to the fact that the ‘war for talent’ really is happening, right here, right now. The trends are coalescing to create an unprecedented demand for talented people and an unprecedented shortage of traditional sources of talent, namely young people and more experienced professionals. 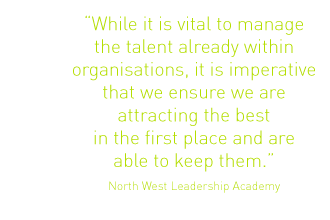 The North West Leadership Academy’s initiative drew attention to what other successful talent management systems have placed emphasis on: attracting and recruiting, deploying, performance managing, developing, rewarding, engaging, retaining, tracking and exiting. The Academy designed a comprehensive talent management framework that enables organisations to assess the performance and potential of individuals. This aimed to provide an indication as to the readiness of individuals to progress to the next level, as well as a consolidated picture of the pool of people able to progress within time frames. It can be used for any Key Roles as defined by an organisation. The next job now (0-12 months). Identified higher-grade positions within 1-3 years. Identified higher grade positions within 3 – 5 years. Job rotation at the same level. Lateral assignments on temporary relief or Project work. By ensuring the organisation has a multi-level succession plan, there needs to be at least one successor identified for each key job in the organisation. By identifying these individuals well in advance of specific need, staff can be given any development and stretch opportunities to ensure they are fully prepared to take on the role and challenge when it arises. This ensures the organisation avoids any panic situations by a key post holder handing in their notice with no successor identified, or a potential successor not being at a stage where they are ready to step into the role. This may only be a temporary solution but provides resilience at all times. What was TBG’s role in this initiative? to explore their career aspirations and development needs in a coaching conversation. In 2010 we have been coaching a number of people from organisations across the North West who have been identified as having potential since this initiative began.